Do you like the flowing lines and moderation of a brush, but want the simplicity of a pen? The makers of Micron have a solution. The Pigma brush. The ink is the same as the Micron ink. It is a very deep black that applies smoothly to the page and rarely bleeds. It is waterproof and fadeproof archival ink. It marks just as well or better than any pen around. 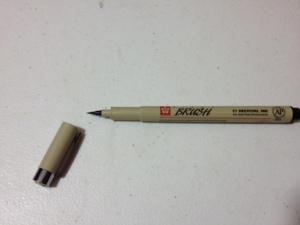 The body of the brush is the same as the Micron’s, as well. It is slick and glossy, but fortunately easy to hold, and never once felt like it was slipping in my hand. The cap locks in place firmly and snaps haphazardly onto the back. The clip attached to the cap works das designed. The writing on the body is easy to read and rub resistant, and the identification on the cap is easy to read. But now for what this item is about: the brush. 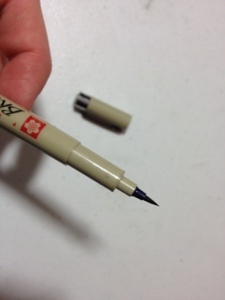 The brush is fairly short, no longer than the nib of the regular Microns or most other pens. 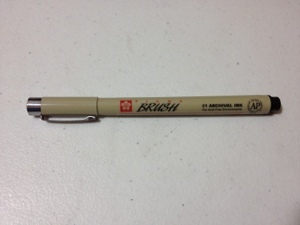 The brush at its finest is super thin, and goes up to an above average pen thickness. The line range is roughly equivalent to the Micron 005 to 05 and everywhere in between. The application is buttery smooth and never splutters or splatters. Even when the brush begins running out of ink you will only begin to get a grey line instead of a patchy one. And it takes a long time to get it to run out. For fine detail work this item is perfect, it is a perfect addition to the Pigma family and suits the audience it was created for perfectly. But it is for a specific audience. Very large or multimedia projects will find the product ill suited to create most desired effects. But that does not diminish the fact that it is a very good pen.